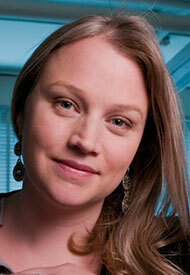 Lindley Winslow is an experimental nuclear physicist whose primary focus is on neutrinoless double-beta decay. Neutrinoless double-beta decay is an extremely rare nuclear process which, if it is ever observed, would show that the neutrino is its own antiparticle, a Majorana particle. A Majorana neutrino would have profound consequences to particle physics and cosmology, among them an explanation of the universe’s matter-antimatter symmetry. Winslow takes part in two projects that search for double-beta decay at CUORE (Cryogenic Underground Observatory for Rare Events) and KamLAND-Zen, and works to develop new, more sensitive double-beta decay detectors. Winslow received her BA in physics and astronomy in 2001 and her PhD in physics in 2008, both from the University of California at Berkeley. After a postdoctoral fellowship at MIT, she was appointed as an assistant professor at the University of California at Los Angeles. Winslow has also been awarded a 2010 L’Oréal for Women in Science Fellowship. Winslow was appointed as an assistant professor at MIT in 2015.